It’s great to have tools that are backed by solid science and research to help your herd. But beyond using the right products and working with a great nutritionist to fine tune your feeding program, what are other factors that can significantly impact on your bottom line? I want to discuss the human side of the equation – proper management of the people involved in feeding the cows can help maximize the value of your feeding program. In my role as Dairy Technical Trainer, I regularly work with feeders on dairies across the country. 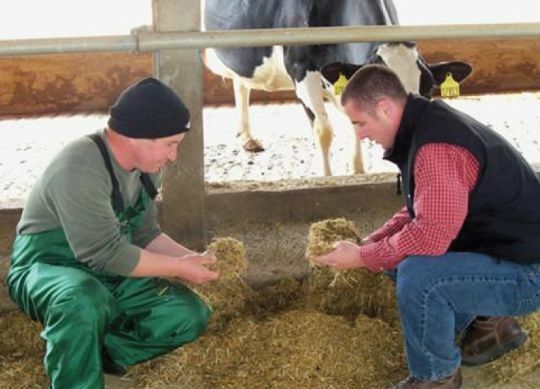 Every farm has its own unique challenges, but one common theme among all farms is: the more knowledgeable and motivated the employees are, the more successful the dairy will be. I teach the “why” behind the many steps involved in the feeding process. A dairy can have great cows, great facilities and the perfectly designed ration, and still underperform if the people involved in delivering feed are not getting it to the cows in the right way and at the right time. It is gratifying to see things improve on a dairy when everyone understands how important their jobs are and works together to achieve a common goal. I encounter few employees on a dairy who don’t take pride in their work and don’t want to do a great job. However, it is all too common for this positive energy to be negated by poor communication, lack of understanding of expectations for their performance and that of the dairy, and lack of understanding of what “proper procedure” is. Here are a few key points that I have found help greatly when working with farms on their feeding programs. Avoid language barriers – It may seem like your key feeders speak great English and understand everything you are saying. However, when you are discussing important concepts that have a huge financial impact, it is not safe to assume such. People are often self-conscious about their proficiency in a language that might not be native to them, and they are often unwilling to let you know that they don’t understand.If you don’t have a bilingual employee that can help you communicate the message in Spanish (or whatever language the employees might speak), get someone to help. Your nutritionist or veterinarian, local extension agent or a representative from a health and nutrition company like Diamond V may offer translation skills for customers. Tell them the importance of their roles to the success of the farm – Everything starts with nutrition. If the right feed does not get to the right cows at the right time, negative consequences follow, affecting everything (and everyone) else on the farm. Make sure they know this! Emphasize consistency – If there is one word that describes our overall goal in a feeding program, it’s consistency. Discuss the importance of consistency in mixing and feed delivery. Cows are creatures of habit and anytime we present them with a change, we affect them negatively. Explain to your employees why this is so important. Emphasize accuracy – Feed is the most expensive line item of all your costs on a dairy. Share this information with your feeders. Let them know how much the wagon full of TMR or the big pile of refusals that they just pushed off the feed pad this morning weighs/costs. If you use feeding software or closely track feeding accuracy, be sure to share with your feeders how accurately they are performing. Emphasize communication – First, clearly communicate your expectations for their performance. Second, make sure they know that if anything is not right with equipment or feedstuffs, or there are conflicts with other employees, you need to know about it in order to fix it. Acknowledge and thank workers any time they bring an issue of concern to your attention. Finally, take action. Take steps to correct the problem whenever possible.Even if an immediate fix is not feasible, explain to them that you know the problem exists and that you will address it when you can. One common instance where I find communication breaks down is when employees have brought issues to management’s attention and either nothing was done about it, it was not acknowledged, or both. Along the same lines, make sure employees are communicating effectively with each other. If communication issues are apparent or in question, talk with the employees involved separately, then consider a group meeting to get everyone back on the same page. Focus on Feedback – Give feedback often, and don’t forget to acknowledge when people are doing things right! Observe feeders mixing and delivering feed on a regular basis, and find some opportunities to give positive feedback before you bring up an issue that needs to be addressed. Always start with the task they do well. Then, when you do have to provide constructive criticism or corrections, you have a greater probability that they will be receptive to what you have to say. Make a plan for future follow up with the employee to review progress.